Take a guided bushwalk with Josh to forage for native bush foods, and medicines and discover their cultural uses, then sample traditional foods. Take a guided bushwalk with Josh to forage for seasonal native bush foods and medicines and discover their cultural uses, immerse all 5 senses in this full 3 hour tour. Journey into Ngilgi Cave for Josh’s authentic storytelling of the Dreaming and a unique didgeridoo experience; this is the only place you’ll ever hear the ancient instrument through the awesome acoustics inside a cave. Learn about the six Noongar seasons and how they influence what is hunted and gathered. Discover the art of traditional fire lighting and tool making, as Wadandi custodian Josh demonstrates how to create a spark by rubbing two sticks together and explains how his ancestors created the artifacts you can touch and feel. Finally, taste traditional foods and flavours around Josh’s campfire with a gourmet BBQ lunch. 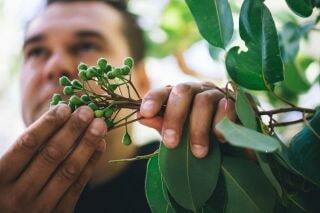 Depending on the season, these could include kangaroo, emu, quandong, emu plum and salt bush. Includes gourmet BBQ lunch with native food tastings. For further information or to make a booking. My friends and I found you very informative and knowledgeable. The tour was well organized and set at a good pace. The kids were engaged and had lots of fun. The food was delicious, well prepared and in generous portions and perfectly suited to all our palates, including the kids, who couldn’t get enough of the roo and mussels! It was wonderful experience that we all enjoyed and would not hesitate to recommend it to others. We are also planning to come back for another one of your tours! We send our very best wishes to you and your family. The tour was beyond all expectations. The southwest was brought to life through stories of history and the cultural significance of various sites to the Aboriginal people, somehow giving us a feeling of connectedness to the region. The cave was beautiful and Josh’s talent in dreamtime storytelling and didgeridoo created an extremely moving, nigh on spiritual experience. The food was authentic and tasty, and our group learnt so much despite having lived in the southwest for years! Josh is a genuinely talented and warm person and it was a privilege to have him guide us through the life and country of his family and ancestors. An amazing experience that I recommend to all visitors, and to all locals like myself who would like to know more about this special place. 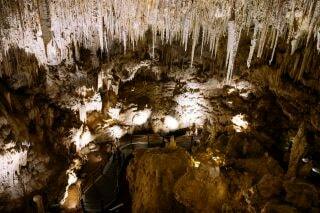 We did the “Food, culture, cave and didg” tour which was great value for our group!! Interested in this Tour? Contact Us for more information or BOOK NOW! This tour requires a minimum of 4 partipants to operate. A Private Tour option is available for Groups with less than 4 people for flat fee of $450.